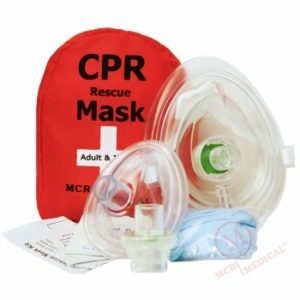 MCR Medical offers several different options for its CPR rescue mask. Having a CPR rescue mask will help you perform CPR with more confidence and offer better rescue breaths. You may not know why some people carry a CPR rescue mask and/or CPR key chains. You may not even know what they are. It’s OK. I had no idea what they were until I started working here at MCR Medical. Whether it be in your home, office, at school or on a ball field, I believe having a rescue mask available will encourage more people to perform CPR with rescue breaths. Preferred by professionals, yet easy enough to use for any rescuer, the rescue mask makes resuscitation safer for the responder and more efficient for the patient. Since you won’t be pinching the patient’s nose shut, each rescue breath will have two avenues of entry into the body. By using this type of mask, rescue breathing is more efficient. Supplemental oxygen, connected by way of the mask’s oxygen inlet, increases concentrations of organ-sustaining oxygen by 50%. MCR Medical offers individually packaged, label-free clamshell mask case with wrist strap is manufactured for us exclusively. The quality transparent mask features a one-way filter valve and elastic head strap to facilitate hands-free operation. A pair of gloves, antiseptic wipe and instruction card completes the set. Whether you’re a lifeguard, or on your county’s Emergency Response Team, this is the breathing barrier to carry in your pocket or keep in your first aid kit. Lay responders as well will find the easy to use mask an invaluable asset when called upon to breathe for a patient, regardless of their age. Pick up several to keep at home, in your car or anywhere you might need to utilize your resuscitation skills. You too can be ready with the right tools! You may now be asking what is a barrier device? One of the components of CPR is rescue breathing which provides valuable oxygen to the body. Using a barrier on the mouth and face will protected from the transfer of fluids while performing CPR. Effective CPR provided by a bystander immediately will help in increasing the chances of survival of a cardiac arrest victim. 95% victims of cardiac arrest die prior to reaching a hospital or medical care facility without CPR. If a bystander does not perform CPR, the survival chances of a victim will decrease 7% every minute of delay. Within 5 to 6 minutes with no CPR performed the victim might further suffer from brain death crisis. As per studies, 45% heart attacks occur among people under 65 years of age. As per AHA 1 in 6 men and 1 in 8 women above 45 years of age have had a stroke or heart attack. Everyone should have the best tools to perform CPR. Order your CPR rescue mask or CPR key chain today!